Four countries. Three world capitals. Medieval strongholds, modern art museums, towering castle ruins and gorgeous wine country. You'll only have to unpack once as you travel aboard the River Beatrice – among the finest ships in its class – along the Danube from Passau, Germany, to Budapest. Throw in gentle riverside riding on Europe’s longest dedicated bike path, spiced up here and there with a foray into the hills beyond and our trademark culturally immersive events. It’s an incomparable way to discover Mitteleuropa, one of the world’s oldest “exciting new” travel destinations. Begin riding along the Danube Bike Path towards Passau where we will eventually board the ship that will serve as our floating hotel and spa for the week. Familiarize yourself with the vessel tonight before we regroup for introductory cocktails. This morning, ride along the Inn River bike path toward the 'Friendship Bridge' linking Germany and Austria. Stop for a mid-morning coffee in true Bavarian style (with whipped cream!). Enjoy a private tour of the Old City in Passau before a special private dinner tonight in the Captain's lounge. Awake to the sight of Linz! Ride through forests, past family-run farms and into the historic center of Eferding. Stop for lunch on the banks of the Danube, before crossing and returning to Linz through more pastoral landscape. Pedal in the Wachau, a memorable section of the Danube renowned for its photogenic vineyards. If you’re keen for a workout not involving a saddle, you can have a go at the vigorous climb up to the castle ruins! Enjoy breakfast at the passenger port of Vienna before riding on Donau Island. Lunch will be back on the ship before we enter the historic centre of Vienna for an informative city walk (and a memorable surprise). Begin riding along the left bank of the Danube, through the rich reserve of the 'Donau Auen' National Park. Halfway to Budapest, we`ll stop at the Kaiser`s former digs for lunch and a piece of his favourite dessert, the recipe of which was a state secret until it was stolen! After a final breakfast on the water, we part company this morning. 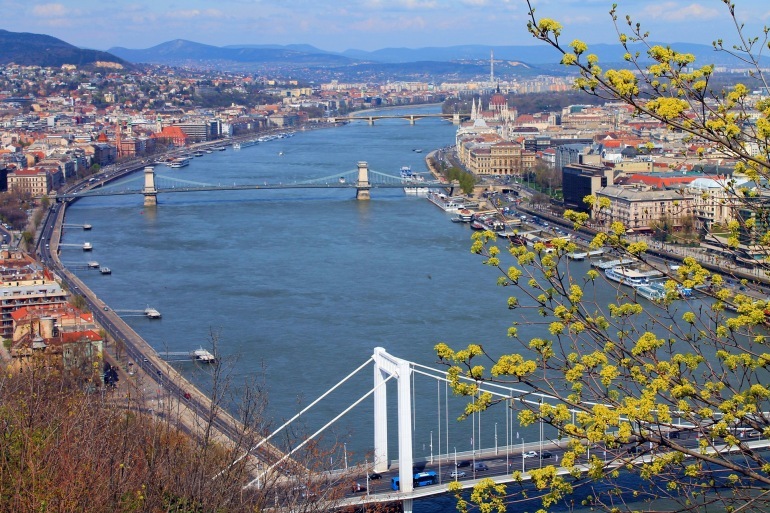 We highly recommend a few more days in dynamic Budapest, but if you must depart immediately, an airport transfer organized by our ship is readily available with prior reservation. The 75-stateroom Maria Theresa was built in 2015, and earned the “Best New River Ship” award by Cruise Critic editors in the same year. A baroque homage to the former Austrian empress from bow to stern, the S.S Maria Theresa is among the newest and most lavish river boats on the Danube. Suites are individually decorated; all B&R cabins boast French balconies affording wide views of the riverscapes. The vessel is fully airconditioned, and features high-quality beds and linens, marble bathrooms with Occitane accessories, and a knowledgeable, professional crew of 50-plus. The restaurant, often resupplied with fresh regional ingredients en route, offers an array of beautifully prepared starters and entrees, as well as a sumptuous buffet breakfast, all in a panoramic setting. Most of the riding on this trip is flat to gentle on the Danube bike path or other dedicated bicycle paths. There are a few hills to be biked, especially on Days 2 and 6. There are numerous long options for eager riders. Road surfaces are either paved or consist of hard-packed dirt and gravel. B&R therefore strongly recommends the use of hybrid bicycles for this trip. Daily elevation gains range between 25 m (82 feet) and 250 m (820 feet).